Endodontic infections are polymicrobial in nature with preponderance toward anaerobic species, and several studies have found fungi, apart from bacteria and viruses, in endodontic infections. The most common organisms isolated from the root canals with post-treatment apical periodontitis are Candida albicans and Enterococcus faecalis. ,, The goal of endodontic treatment essentially is debridement, i.e. to disrupt and remove the microbial ecosystem associated with the disease process and to neutralize any antigen that may be left in the canal after the elimination of the microorganisms. Therefore, the infected root canal is subjected to combined chemo-mechanical treatment involving instrumentation and copious irrigation with disinfectants. Still some bacteria and their products could persist in the dentinal tubules, in the root canal system, or in the smear layer produced by instrumentation. To inactivate this inflammatory burden, lasting antibacterial intracanal medication can be utilized between endodontic appointments until the final sealing of the canal. Since C. albicans are frequently recovered from the re-treatment cases, it shows that they are able to survive in environments with sparse nutritional supply. A combination of irrigant, chelating agent, and medicament may be useful to eliminate C. albicans from the root canals. Thus, the present in vitro study was undertaken to check the efficacy of 3% NaOCl, 17% EDTA, 2% CHX, and Ca (OH) 2 in various combinations on C. albicans in the root canals for 48 h and 10 days. Ninety-five freshly extracted, caries-free human permanent single-rooted incisors, canines, and mandibular premolars were used in this study. Each tooth was radiographed to confirm the presence of a single and straight canal. The teeth were stored in 10% formalin for disinfection and fixation of organic tissue for a period of 24 h, followed by cleaning of the external debris and calculus with an ultrasonic scaler. They were stored in physiologic saline until use. The crowns were sectioned with a diamond disk such that the root length was standardized to 16 mm. The working length of each tooth was determined by using a size 10 K-file and teeth with apical diameter greater than size 10 K-file were discarded. After coronal preflaring with Gates Glidden drills, apical preparation was done using hand K-file till size 50. Canals were irrigated with 3 ml of 3% NaOCl solution during the procedure. After instrumentation, the smear layer was removed with a rinse of 1 ml of 17% EDTA for 1 min followed by rinsing with 3 ml of 3% NaOCl. Finally the canals were flushed with 5 ml of distilled water to remove any debris and residual irrigants. The external surfaces of the roots were coated with epoxy resin (Araldite, Huntsman, Switzerland) and the root apices were sealed with temporary cement (Cavit™ G; 3M ESPE, Seefeld, Germany) [Figure 1]a. After setting of the epoxy resin, all the roots were sterilized by autoclaving at 121°C for 20 min [Figure 1]b.
C. albicans broth (strain MTCC 183) was prepared and kept for overnight incubation. The broth was then matched with a spectrophotometer to 0.5 turbidity on the McFarland scale, which corresponds to 1.5 × 10 8 microorganisms/ml. Ten microliters of the inoculum was injected into the prepared canals with the help of micropipette inside laminar air flow chamber. Teeth were sealed coronally with temporary cement (Cavit™ G; 3M ESPE, Seefeld, Germany) after placing sterile cotton ball over access opening of the canals. Then, the teeth were placed on a gauze pad in sterile petri plate and incubated at 37 ΁ 1°C (in humid conditions) for 7 days. To facilitate the growth of C. albicans, on the 4 th day, all teeth were reopened, 1 ml of nutrient broth was added into the canal, and the roots were again sealed with temporary cement (Cavit™ G; 3M ESPE, Seefeld, Germany) for 7 days. On the 7 th day, the teeth were reopened, microbiological sampling was carried out individually by placing sterile paper points into the root canals for 60 s, and then the teeth were again kept in the incubator after coronal sealing. The paper points were placed in a test tube containing 1 ml of sterile saline solution and incubated for 30 min at 37°C and then shaken in a vortex mixer for 60 s. After this, serial dilution of the microbiological sample was done in Eppendorf tubes and the serially diluted microorganisms were plated on to Sabouraud dextrose agar (SDA; HiMedia, Mumbai, India) and incubated at 37°C for 24 h to determine the colony forming units (CFUs)/ml. The CFUs/ml were counted with a 10 × magnification and only the CFUs more than 30 units was taken into consideration. The average value of CFUs/ml of C. albicans was 32 × 10 5 in all the roots. After this, temporary filling was removed from all the 95 teeth kept in the incubator. The canals were dried using paper point for gross excess fluid removal to prevent the dilution of the irrigants before the experiment. Teeth were randomly divided into three groups. Group I (n = 15) was taken as the control group and only saline was added to it. In group II (n = 40), 1 ml of 3% NaOCl was used as the irrigant for 1 min, followed by normal saline. In group III (n = 40), 3% NaOCl and 17% EDTA were used as irrigants followed by normal saline. Groups II and III were further divided into two subgroups (A and B) having 20 teeth each. After irrigation, Ca (OH) 2 mixed with distilled water (3:1 ratio) was placed in subgroup A and 2% CHX solution in subgroup B of both groups as the intracanal medicament. After this, a sterile cotton ball was placed on root canal opening and teeth were sealed coronally with temporary cement (Cavit G; 3M ESPE, Germany). Then teeth were kept in the incubator at 37°C. After 48 h, the coronal seal of 45 teeth (5 from the control group and 10 from each subgroup) was removed and the canals were irrigated with 1 ml of sterile saline. They were then instrumented with no. 50 H-file to create dentinal shavings and microbiological sampling was carried out by placing sterile paper points into the root canals for 60 s. The paper points were placed in test tubes containing 1 ml of sterile saline solution, incubated at 37°C for 30 min, and shaken vigorously for 60 s in a vortex mixer. Serial dilution and culturing was further carried out to determine CFUs/ml. On the 10 th day of incubation, the coronal seal of remaining 50 teeth (10 from the control group and 10 from each subgroup) was opened, and subsequently, microbiological sampling and serial dilution followed by culturing were carried out as explained previously. For statistical analysis, Statistical Package for Social Sciences (SPSS version 15; SPSS Inc., Chicago, IL, USA) was used. Significance level was set at P ≤ 0.05. After 48 h, group I (control group, which was not treated with any medicament) had 31 × 10 5 CFUs/ml of C. albicans. In the study groups (II and III), the application of irrigant and intracanal medicament resulted in decreased values of C. albicans. In subgroup IIA [NaOCl, Ca (OH) 2 ], the growth of C. albicans was reduced to 1.98 × 10 5 CFUs/ml, while in subgroups IIB (NaOCl, CHX) and IIIA [NaOCl, EDTA, Ca (OH) 2 ], it was further reduced to 0.29 × 10 5 and 0.13 × 10 5 CFUs/ml, respectively. Subgroup IIIB (NaOCl, EDTA, CHX) was the most effective against C. albicans, showing a value of 0.095 × 10 5 CFUs/ml at 48 h [Figure 2]. On the 10 th day, all subgroups further reduced the growth of C. albicans [Figure 3], but again subgroup IIIB was the most effective against C. albicans when compared to any of the subgroups, showing a value of 0.025 × 10 5 CFUs/ml. There was statistically significant difference in all the groups and subgroups between 48 h and 10 days [Table 1]. Microorganisms play a fundamental role in the etiology of pulp and periapical disease. While primary endodontic infections are polymicrobial in nature, the microorganisms involved in secondary infections are composed of one or few bacterial species. In 1997, Waltimo et al. studied the occurrence of microorganisms within 967 root canals of teeth with persistent periapical lesions and the most common species among the 48 strains of fungi isolated from 7% of the culture-positive samples was C. albicans. C. albicans has been considered a dentinophilic microorganism because of its invasive affinity to dentin and, hence, is most often found in endodontic infections. , It has the ability to grow on the dentinal surfaces in the absence of oral fluids and penetrates into dentinal tubules to a variable extent by its different growth patterns like hyphae and blastospores. , Hence, in this study, the antimicrobial activities of various irrigants and medicaments on C. albicans were tested in the extracted teeth in preference to agar diffusion test. It is truly said that instruments shape and irrigants clean. Irrigation is important for root canal treatment as it assists in removing bacteria and debris within the intricacies of the root canal. Higher the concentration of NaOCl, better are the antibacterial and tissue dissolution properties, but at the same time, more are the chances of tissue reaction. Also, 5.25% NaOCl has an unpleasant odor when compared to a 3% solution. Hence, 3% NaOCl is clinically more acceptable and has been used in this study. Mechanical instrumentation produces a smear layer that adheres on the walls of the root canal. Manjunatha et al. have shown that hand instrumentation causes the least amount of smear layer as compared to rotary instrumentation. This smear layer is composed of both organic and inorganic particles. This deposit can be penetrated by bacteria and may offer protection to biofilms adhering to the root canal walls. Though NaOCl is the preferred irrigant in endodontic therapy, it cannot remove inorganic components and, therefore, cannot prevent the formation of a smear layer. One has to rely on demineralizing agents like EDTA or citric acid to remove the smear layer, which also softens the dentin and makes shaping procedures easier. EDTA reacts with calcium ions in dentin and forms soluble calcium chelates. It is highly effective in removing the smear layer from the root canal walls. EDTA is commercially available as a 17% solution as an endodontic irrigant. Hence, 17% EDTA was our choice as the irrigant in group III [NaOCl, EDTA, Ca (OH) 2 /CHX]. Chemomechanical preparation is effective in reducing the number of microorganisms, but not in completely eliminating them. Microorganisms may remain viable even after root canal preparation, multiplying between appointments. Thus, intracanal medication may be a valuable adjunct to chemomechanical preparation in further disinfection of the root canal system. CHX is widely used for disinfection in dentistry because of its good antimicrobial activity. CHX has been shown to have long-term antimicrobial properties because of its unique ability to bind to hydroxyapatite. Unlike NaOCl, it lacks tissue dissolving properties. ,, Vianna et al. proved CHX liquid to be a stronger disinfectant than CHX in gel form at various concentrations. In the same study, it was proved that 2% CHX liquid was more potent than 1% and 0.2% liquid against selected microorganisms. Hence, in this study, 2% CHX liquid was used. Various effects take place if irrigants and medicaments are mixed together. NaOCl and EDTA are the two commonly used irrigating solutions and they have different characteristics and tasks. However, EDTA instantly reduces the amount of chlorine when mixed with NaOCl, resulting in the loss of NaOCl activity. Studies have shown that CHX and NaOCl are not soluble in each other, and a brownish orange precipitate (parachloroaniline) is formed when they are mixed and this may have mutagenic potential. Similarly, mixing CHX and EDTA immediately produces a white precipitate. Although the clear supernatant has not been thoroughly studied, it seems that the ability of EDTA to remove the smear layer is reduced. Hence, in this study, samples were irrigated with saline between each irrigant and before the placement of medicament to prevent any decrease of efficacy of the irrigants or medicaments used. In this study, after instrumentation, microorganisms were inoculated within the canal and allowed to grow for a period of 7 days, followed by placement of irrigant/intracanal medicaments. Hence, this study was done to evaluate the effectiveness of the irrigant/medicaments only and not to find the cumulative effect of instrumentation and irrigation/medicaments. Bacteriological samplings were taken at 48 h and at the end of 10 days. These two time periods were selected so as to evaluate the short- and long-term effects of the medicaments. In this study, the bacteriological sampling was accomplished with a sterile paper point that absorbed the root canal contents. The advantage of using paper points is that it can be used in vitro and in vivo, while its limitation is that the microorganisms in the root canal can be sampled, but those in the dentinal tubules are sampled to a limited extent. Hence, the canals were instrumented with no. 50 H-file to create dentinal shavings and then sampling was done. Further, serial dilution was performed in the control and study groups at 48 h and on the 10 th day. Serial dilution is a standard microbiological method that allows us to precisely count the CFUs/ml. The results showed greater reduction of CFUs/ml from 48 h to 10 days in all groups. In groups IIB (NaOCl, CHX) and IIIB (NaOCl, EDTA, CHX), the effect can be attributed to the substantivity shown by CHX. CHX has an affinity to dental hard tissues (hydroxyapatite), and once bound to a surface, it shows prolonged antimicrobial activity by release of biologically active component over a period of time. This phenomenon is called "substantivity." This is in contrast to the effect of other disinfectants, which rapidly lose their potency and have no residual antimicrobial effects. A study by Rosenthal et al. has shown that the gradual release of this bound CHX could maintain the bacteriostatic effect in the root canals over a prolonged period of time which may be up to 12 weeks. Groups IIA [NaOCl, Ca (OH) 2 ] and IIIA [NaOCl, EDTA, Ca (OH) 2 ] also showed reduction of CFUs/ml from 48 h to 10 days. When comparing groups IIA and IIB, the study proved that the combination of NaOCl and CHX showed more effectiveness against C. albicans than the combination of NaOCl with Ca (OH) 2 . This is because the role of CHX is greater than that of Ca (OH) 2 in reducing the growth of C. albicans. Combination of NaOCl, EDTA, and Ca (OH) 2 (group IIIA) showed less CFUs after 48 h, when compared with group IIA [NaOCl, Ca (OH) 2 ]. The reason can be attributed to the action of EDTA. Furthermore, NaOCl, EDTA, and CHX (group IIIB) showed least CFUs/ml when compared with all the other subgroups. This may be the result of the combined effect of EDTA and CHX. One limitation of this in vitro study is that a single microorganism was used to infect the root canal in contrast to clinical situations with polymicrobial endodontic infections. Thus, the irrigant and medicament combination that is effective in vitro may not necessarily be effective against the same microbe in vivo. Within the limitation of this in vitro study, it can be said that the combined effect of both irrigants and medicaments has a positive role in controlling the growth of C. albicans, which may contribute to a more favourable outcome of the root canal treatment. Chandra SS, Miglani R, Srinivasan MR, Indira R. Antifungal efficacy of 5.25% sodium hypochlorite, 2% chlorhexidine gluconate, and 17% EDTA with and without an antifungal agent. J Endod 2010;36:675-8. Peciuliene V, Reynaud AH, Balciuniene I, Haapasalo M. Isolation of yeasts and enteric bacteria in root-filled teeth with chronic apical periodontitis. Int Endod J 2001;34:429-34. Podbielski A, Spahr A, Haller B. Additive antimicrobial activity of calcium hydroxide and chlorhexidine on common endodontic bacterial pathogens. J Endod 2003;29:340-5. Waltimo TM, Sirén EK, Torkko HL, Olsen I, Haapasalo MP. Fungi in therapy-resistant apical periodontitis. Int Endod J 1997;30:96-101. Sen BH, Akdeniz BG, Denizci AA. 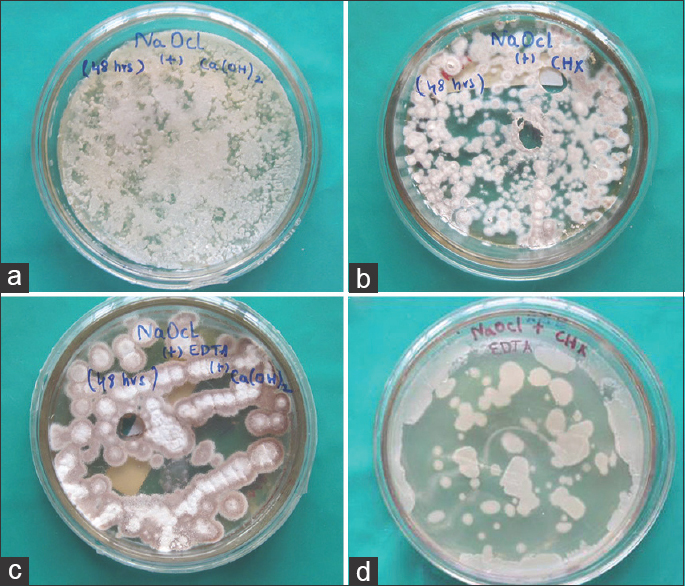 The effect of ethylenediamine-tetraacetic acid on Candida albicans. Oral Surg Oral Med Oral Pathol Oral Radiol Endod 2000;90:651-5. Waltimo TM, Orstavik D, Sirén EK, Haapasalo MP. In vitro susceptibility of Candida albicans to four disinfectants and their combinations. Int Endod J 1999;32:421-9. Waltimo TM, Sirén EK, Orstavik D, Haapasalo MP. 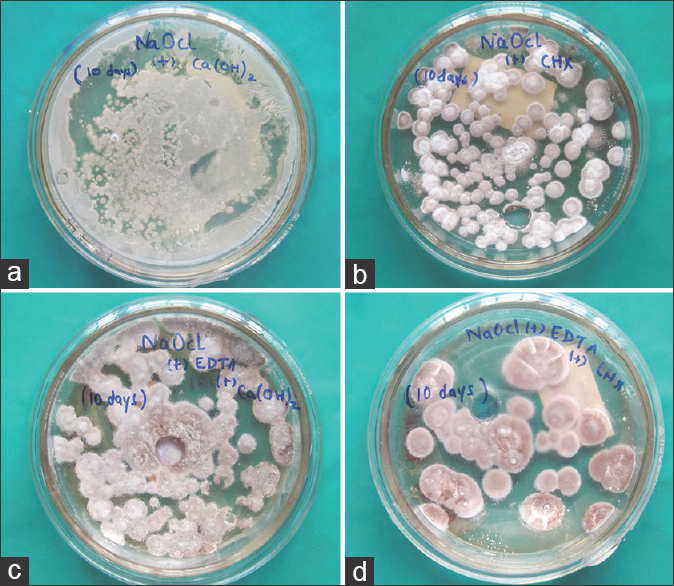 Susceptibility of oral Candida species to calcium hydroxide in vitro. Int Endod J 1999;32:94-8. Ballal V, Kundabala M, Acharya S, Ballal M. Antimicrobial action of calcium hydroxide, chlorhexidine and their combination on endodontic pathogens. Aust Dent J 2007;52:118-21. Giuliana G, Pizzo G, Milici ME, Musotto GC, Giangreco R. In vitro antifungal properties of mouthrinses containing antimicrobial agents. J Periodontol 1997;68:729-33. Siqueira JF Jr, Rôças IN, Lopes HP, Elias CN, de Uzeda M. Fungal infection of the radicular dentin. J Endod 2002;28:770-3. Siqueira JF Jr, Sen BH. Fungi in endodontic infection. Oral Surg Oral Med Oral Pathol Oral Radiol Endod 2004;97:632-41. Manjunatha M, Annapurna K, Sudhakar V, Sunil Kumar V, Hiremath VK, Shah A. Smear layer evaluation on root canal preparation with manual and rotary techniques using EDTA as an Irrigant: A scanning electron microscopy study. J Int Oral Health 2013;5:66-78. Almyroudi A, Mackenzie D, McHugh S, Saunders WP. The effectiveness of various disinfectants used as endodontic intracanal medications: An in vitro study. J Endod 2002;28:163-7. El Karim I, Kennedy J, Hussey D. The antimicrobial effects of root canal irrigation and medication. Oral Surg Oral Med Oral Pathol Oral Radiol Endod 2007;103:560-9. Basrani BR, Manek S, Sodhi RN, Fillery E, Manzur A. Interaction between sodium hypochlorite and chlorhexidine gluconate. J Endod 2007;33;966-9. Naenni N, Thoma K, Zehnder M. Soft tissue dissolution capacity of currently used and potential endodontic irrigants. J Endod 2004;30:785-7. Rosenthal S, Spångberg L, Safavi K. Chlorhexidine substantivity in root canal dentin. Oral Surg Oral Med Oral Pathol Oral Radiol Endod 2004;98:488-92.